Manufacture a big range of size in colour Rubber Band in 100% Latex Rubber Material. Now Pik india are Currently supplying the rubber band in various sizes such as 0.5 Inch, 1 Inch, 1.5 Inch, 2 Inch, 3 Inch, 4 Inch and 6 Inch. 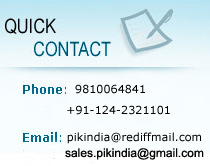 PIK INDIA brand Products are very reliable and widely appriciated by our customers. pik india rubberbands can be developed in any colour as per customer requirement in 100% Latex Rubber Material. Strength up to 30Kg In normal sizes. Durability 3 Years (Minimum) will not melt or break. We offer wide range of heavy duty casterwheel. These wheels are available in various sizes and are very sturdy and their load carrying capacity. These can also be customized as per the specific requirement of our clients.